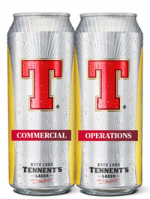 Tennent’s is the producer of Scotland’s favourite pint. We serve up employment opportunities across both Commercial and Operational business areas. Our wide range of opportunities means that with Tennent’s you can find your perfect role. Roles vary from Product Development to Distribution and everything in between. When you join the team at Tennent’s, our aim is to help you realise and achieve your potential. We offer a full pallet of benefits to all our employees and great incentives to reward those who live and breathe our 4T values. Tennent’s – the perfect environment to brew your potential. Hugh Tennent had a Mad Man’s Dream…… do you?